Power outages continue in at least 16 states across the country. The opposition says there has been sporadic looting, and at least 17 people have died as a result of the blackout. On Mar 9, there was an attempted armed robbery of Air Europa airline crew. Armed assailants on motorbikes chased the vehicle of the crew from the airport to their hotel, where they engaged in a shoot-out with hotel security staff before escaping. None of the crew was injured, but refused to stay at the hotel, and instead were escorted back to the airport by police convoy and returned on the flight back to Madrid. Air Europa has reportedly now decided to add a stopover to its Caracas service and crew will now layover in Punta Cana in the Dominican Republic. Local handling agents we have spoken to in Venezuela have also said that the country’s airspace is open again, although nothing has officially been published to confirm this. Our advice remains the same: you don’t want to go to Venezuela at the moment. The official advice of both the US and Canada couldn’t be clearer, they both say the same thing: do not travel to Venezuela due to risks posed by the ongoing unstable political and economic situations and the significant levels of violent crime. 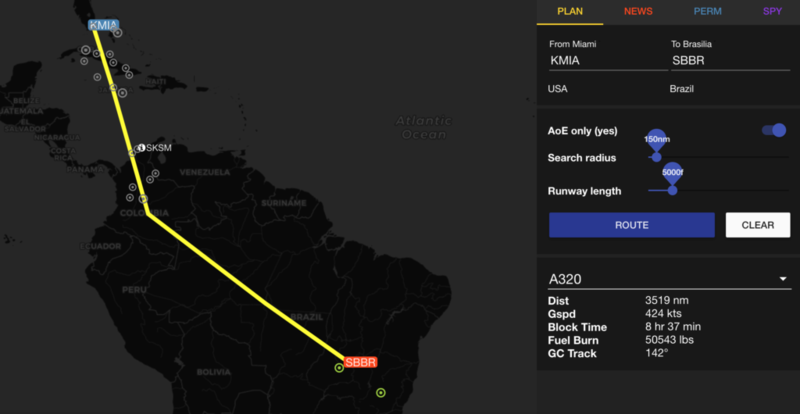 The Maduro government has closed Venezuela’s borders with Colombia and Brazil, and has reportedly positioned one of its air defense missile system near the border with Brazil – within range of Brazil’s SBBV/Boa Vista airport, as well as overflights of most of Guyana’s airspace (SYGC/Georgetown FIR). 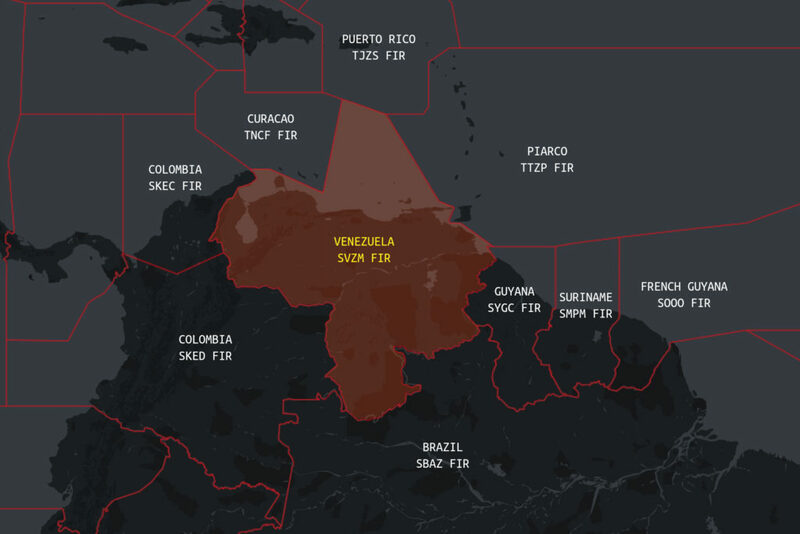 The US FAA has also published a new Notam and Background Notice warning operators to exercise caution when operating in the SVZM FIR below FL260 due to potential hazards to aviation associated with ongoing political instability in Venezuela. – via Colombia (SKED/Bogota FIR) – permit required for all overflights. Note: watch out if planning a flight through the TNCF/Curacao FIR – although a permit to overfly is not required here, you will need to prepay for navigation fees in advance. More on that here. – via French Guyana (SOOO/Rochambeau FIR) – permit required unless operating a GA aircraft under 12.5k lbs. The airport is located in an extremely high-risk area for armed robbery and kidnappings. Before suspending all flights to Venezuela in Aug 2017, Avianca hired bodyguards after shots were fired during a robbery of a bus carrying its crew. 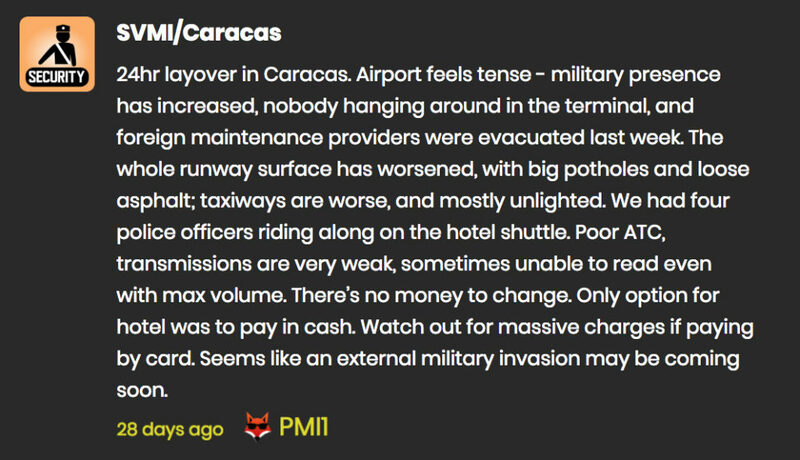 Some other carriers took to flying crew to spend the night in neighbouring countries, rather than risk staying overnight anywhere in Caracas. On Aug 8, 2017, a Venezuelan lawyer was shot dead at a ticket counter at SVMI/Caracas airport. In 2016, an Egyptian visitor was killed walking outside the airport between terminals after arriving on a flight from Germany. In Feb 2018, Ecuadorian state airline Tame joined Avianca in a long list of airlines that no longer operate to the country, including: Aerolineas Airlines, United Airlines, Aeromexico, Lufthansa, Alitalia and Air Canada. Most reports estimate that international traffic in Venezuela has dropped by around 65-75% since its peak in 2013. Colombia’s pilots’ association says its members who have flown to Venezuela have had to deal with contaminated fuel and hours-long delays as the National Guard pulls suitcases off flights to loot them. More info. Opsgroup team member. International flight ops news hound.